Today, guest blogger Patrice of Life Less Ordinary writes about camping in a yurt in New Hampshire. Not sure what a yurt is? Be sure to check out Patrice's earlier post about yurt camping at Frost Mountain in Maine. Since this summer, the model at Green Alpaca has been open for a quick look or for rent as an overnight excursion. Farm owner Val Newell is thrilled to have the yurt model on her property and is happy to share her love of yurts with others. The yurt at Crown Point Alpaca Farm is set back in the woods, up on a hill and extremely private. As with Frost Mountain Yurts, there is no running watter or electricity and no vehicle access. This one has two bunk beds, a futon, and all the supplies you need for an overnight: dishes, silverware, cookware, propane stove, grill, candles, games, and more. I have to point out that I liked the outhouse here better than the one at Frost Mountain; it's the little details that count! There are snowshoe/ski trails all around the area, although we didn't explore this time. The bonus, though, was being able to experience the farm. With more than 65 alpacas and tons of ducks, chickens and turkeys, I would say it's a very kid-friendly place. You could even request farm fresh eggs to cook up for breakfast! Again, I highly recommend yurt camping. Try it once and, like us, you just might find yourself going back for more. Lucie's note: I'm jealous! We haven't been able to camp in a yurt yet, but it's on my wish list for 2010. Sounds so appealing...to be surrounded by nature, to be able to escape electronic distractions and enjoy peace and quiet! If you've tried it, be sure to leave a comment and let us know what you thought. Today I'm excited to publish another guest post by Patrice, a fellow blogger and adventurer. Be sure to check out her witty take on life at Life Less Ordinary. You can also read an earlier post she wrote for New Hampshire: Love it or Leaf it on Camping at Squam Lake. She and her husband "J" are never sitting on the sidelines! I am so in love with the idea of camping in a yurt that I want everyone to try it once. My husband Justin and I tried it for the first time as a New Year's vacation and we will definitely be doing it again; in fact, we may buy our own yurt sometime in the future. If you've never heard of a yurt, I think the best way to describe it is as a cross between a tepee (but much bigger) and a cabin. The walls are canvas and there's a door and even some windows. For our trip, we stayed at Frost Mountain Yurts in Brownfield, Maine, which is only 16 miles from Conway, New Hampshire. They have four yurts for rent on 60 acres of land. In my opinion, this is the most luxurious form of "camping" out there in all seasons, but it works really well for winter camping. Let me get right to the dirty details. Typically, you cannot drive to the yurts. The ones at Frost Mountain were approximately 1/10 mile from the parking area, but with snow and hills, we relied on our snowshoes to make the trek easier. So it's a cross between backpacking (hiking in) and car camping (driving up to a site). Most yurts for rent have no running water. You pack in whatever water you think you'll use. My advice? Wash dishes in a bucket and be conservative, dumping your dirty water in a concentrated area away from the yurt. Frost Mountain provided non-drinking water, so we brought our own drinking water. Some yurts, including the one at Frost Mtn., have a solar shower for use in the summer. They should all have some sort of outhouse. The idea of a yurt is to escape the hustle and bustle of daily living. So no electricity either. Many yurt rentals provide candlelight and gas lanterns, but we also brought extra flashlights. How do you keep warm, you ask? All yurts are heated by wood-burning stoves and usually cut wood is provided. Our yurt stayed toasty, despite the fact it was frigid outside. The Frost Mtn. Yurt was well-equipped, so we just packed in our food, drink, clothes and bed linens -- carried in on sleds. We brought a cooler because we were there for four days and we actually ate better than we do at home: cheese fondue, French toast, bacon, chocolate fondue. The yurt was supplied with a fondue pot, three-burner gas stove and a grill. The yurt had lots of games and you can also borrow cross-country skis or snowshoes for free. There are miles of trails to explore or you can just spend the whole time staying cozy in the yurt and enjoying the serenity. The yurt we stayed in slept eight people, but there were only two of us. I think the cost was $85 per night. So there you have it: the basics of our first yurt camping experience. If yurt camping is in your future, be sure to check out the Web site of the company you're planning to rent from; generally, there's lots of helpful information there. Next on our agenda is a weekend overnight yurt trip at Green Alpaca Farm in New Hampshire. I'll be sure to update you if there's new information to add. In the meantime, I encourage everyone to set a goal in 2010: Stay in a yurt. I promise you, there is truly something magical about it! Snowshoeing has become a "hot" winter sport. Lots of nature centers, mountain areas, and organizations are now promoting some type of snowshoeing activity. It's fun, low cost, and easy to do. And there's plenty of room out on the trails. So, here's a sampling of some guided snowshoeing programs to check out in New Hampshire this winter. And for those of you who prefer to go out without a guide, check back soon -- I'll be posting some trails you can explore on your own. Beaver Brook Association (Hollis, NH) -- There's something for everyone here. There are Beginner Snowshoe Hikes for Women on Jan. 30th and Feb 27th; A Yoga and Snowshoe program on Jan. 16th; Wildlife Tracking on Snowshoes on Jan. 24th, as well as Winter Fitness Hikes at a moderately fast pace every Friday morning, January through March, plus more. Check it all out in their winter newsletter. Nashua Parks & Recreation Department is hosting a snowshoe program beginning January 13th. It's a daytime activity, taking place in Mine Falls Park in Nashua every Wednesday and Friday morning at 10 a.m. For more information, call Tom at 603-589-3370. 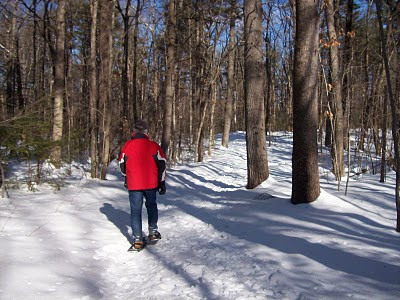 Eastern Mountain Sports offers a guided snowshoe trek along the Saco River in North Conway, NH. Check out the Eastern Mountain Sports site for more. Loon Mountain has a guided snowshoe hike of the summit. This one is for intermediate snowshoers. Check out the Loon Mountain site for details. Jackson Ski Touring Center offers instructional guided nature hikes on snowshoes throughout the winter. Check out their website for information. NH Audubon Society offers snowshoe programs as well. In Auburn, the Massabesic Audubon Center rents snowshoes throughout the season and has a guided Snowshoe and Tracking program on Feb. 13th. 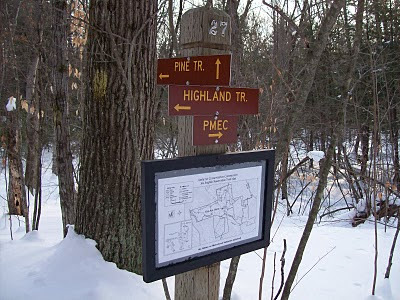 The McLane Center in Concord offers Winter Wildlife Hikes on snowshoes, conditions permitting, of course. So there you have it! A few programs to get you started on this great cardio activity, particularly if you are new to the sport and looking for guidance. If you know of any other programs in the state, be sure to leave a comment. Happy New Year, everyone! I'm excited to see where 2010 will take us all. It's been a while since I've posted; let's just say that "everyday life" sometimes gets in the way of pursuing our passions. But here I am today, looking forward to our first snowshoe adventure of the season (sometime soon I hope) and pausing to think about my blog resolutions for 2010. I promise to write a short post on some great snowshoeing programs in the next day or two. For now, I'd like to discuss my vision for the future of New Hampshire: Love It or Leaf It. In which direction would I like to take this blog in the year ahead? I've given it some thought and realized I'd love to turn this into a true blogging community. What exactly do I mean by that? Well, I would like to encourage many more comments from visitors and maybe even to introduce a live chat. It would be a way for us to learn from each other and gain a fresh perspective. Not sure if I have the technical skills and time to pull off a live chat feature, but I can dream! Secondly, I want to open up the blog to more guest bloggers. As much as Doug and I try to get out there to explore our wonderful state, we're limited by time and energy. I would like to publish more guest posts from all you folks who are kayaking, biking, snow shoeing, and just plain exploring New Hampshire. How will the blog get from "Point A" (where we are now) to "Point B" (where I'd like to be a year from now)? Well, that's for me to figure out, I guess. For now, I've taken the first step: I've shared my "secret" goals here. In a way, I've challenged myself to make it happen. How about you? 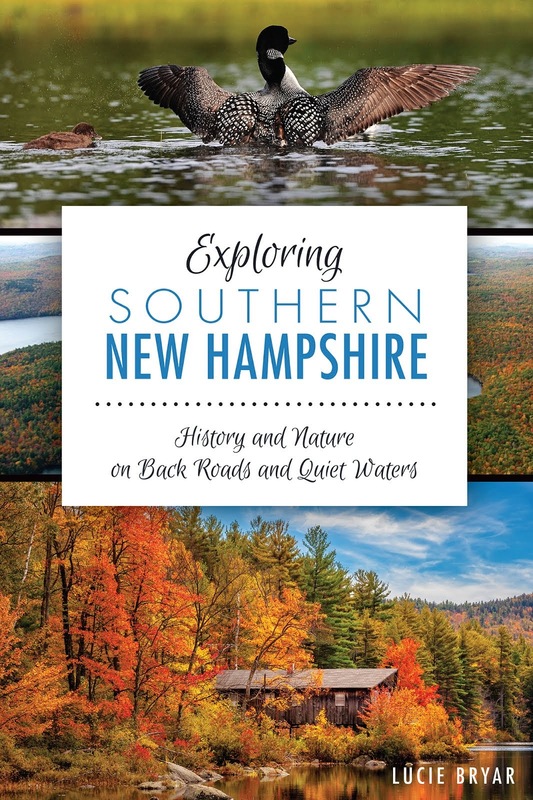 Is there anything you'd like to see on New Hampshire: Love it or Leaf It? Please take a moment to leave a comment. In the meantime, I wish you safe and happy outdoor adventures in 2010!